The City of Batavia is pleased to announce that the construction of the Houston Street Streetscape project is anticipated to begin in late July. This is the third “streetscape” project the city is completing to revitalize the downtown and make it more pedestrian friendly. The project limits are Houston St. from N. Batavia Ave./Rte. 31 to Island Ave. The streetscape project will include wider sidewalks with areas of paver bricks, new ornamental lighting, planting beds, trees, and new storm sewers. The water main within this project area was replaced during 2014 in preparation for the streetscape project. In certain locations bump-outs are being installed to narrow the roadway width to provide shorter pedestrian crossings and at other the locations the bump-outs provide for a landscape area. 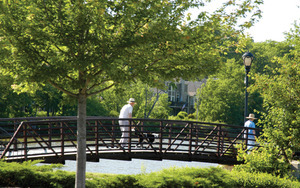 Visit the city’s website at cityofbatavia.net to view a copy of the proposed plan. A public meeting will be announced on the website when it has been scheduled. Curbside residential brush pickup continues monthly through November (see schedule). Only City of Batavia single-family residents that pay the monthly leaf/brush fee on their utility bill are eligible for the curbside residential collection. Please have brush out no sooner than the weekend before your scheduled pickup to prevent possible code violation. Brush cannot be left out on the parkway between collection dates. Keep in mind that crews can move through an area very quickly, and once they pass your address they will not return until the next scheduled pickup date. The amount of brush that has been placed out citywide dictates how quickly your area will be reached, but each side of town is typically completed by Friday of the scheduled week. Major storms may affect the pickup schedule. Residents living in unincorporated areas should contact their township offices regarding the brush collection services that may be available to them. · Brush/limbs are to be at the curb for collection no later than 7am on Monday of your scheduled week. · Please note that the maximum diameter is 6" (logs cannot be split). · Maximum length of limbs is 12'. · Stack brush in one large pile with the cut ends facing the curb away from trees, mailboxes, utility poles/boxes, hydrants, and parked vehicles. · Brush should be placed in the front or side parkway and will not be collected from alleys or vacant lots. · Brush/limbs must not be tied, bundled, in containers, bagged, or in the street. · Do not place stumps, roots, landscape material, lumber, firewood, or foreign objects in pile. · Program is for residentially-generated brush only, not contractor removals or trimming. · Advanced Disposal will collect yard waste bags/32-gallon containers (not to exceed 50 pounds per bag/32-gallon container) consisting of twigs, evergreen clippings, roots, stumps, and plants on your regular trash collection day, through November. Any generic yard waste bag can be used, and a refuse/yard waste sticker should be affixed to the bag or can. Prepaid bags are no longer available. 32-gallon containers must be clearly marked “Yard Waste” on the front. · Residents with limbs/brush exceeding the requirements for the Residential Brush Collection Program can contact a private service to have them removed at the resident’s expense. If your brush was out at 7am on Monday of your scheduled collection week and not collected by the end of the workday on Friday, please notify the Street Division no later than the following Monday. For missed brush calls received after Monday, collection will be handled during the next monthly collection. If you have any questions, please call the Street Division at 630-454-2400 weekdays from 7am–4pm or visit the website at cityofbatavia.net. The color of the refuse/yard waste stickers (lavender) will remain the same. One recycling cart is provided to City of Batavia residential customers. If you need an additional recycling cart, they are available from Advanced Disposal for an additional $1.20/cart/month (35-, 65-, or 95-gallon sizes). To report missed pickups, please contact Advanced Disposal at 630-587-8282 Monday through Friday from 8am to 5pm. If Advanced Disposal does not resolve your issue to your satisfaction or if you have any questions, please contact the Street Division of Batavia Public Works at 630-454-2400. 1. Water main replacement on Maple Ln. between Batavia Ave. and Republic Rd. 3. Water main improvements on W. Wilson St. between Batavia Ave. and Lincoln St.
4. Water service line replacement on S. Batavia Ave. between Morton St. and Carlisle Rd. 1. Pipe lining on Park St.
2. Pipe lining on Columbia St.
3. Pipe lining on River St.
4. Pipe lining on McKee St.
5. Pipe lining in the downtown area between Houston St. and Shumway Ave.
Batavia’s earliest water and sewer infrastructure dates from the era between 1893 and approximately 1920. As such, the city’s continual investment in rehabilitation and replacement of pipelines, manholes, water valves and fire hydrants is important to keep this important infrastructure in good operating condition. Flowers, lawns, gardens, trees, shrubs (also deep root feeders), car washing, and children’s wading pools. New sod or seeded lawns by permit only. No permits for sod/seed issued during months of July and August. Allowing water from city water supply to run off to ditches, gutters, inlets and drains during irrigation is strictly prohibited.